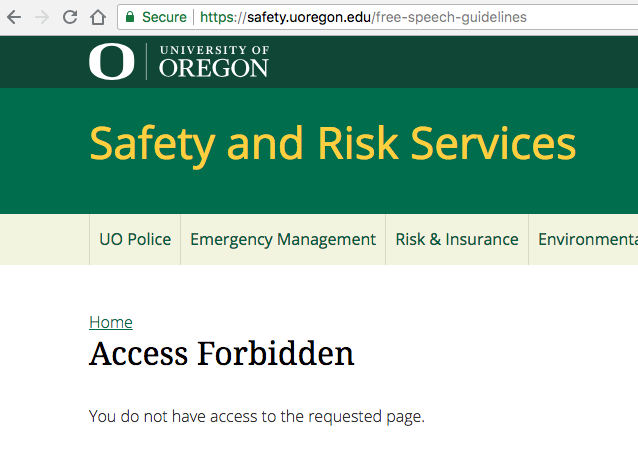 At the University of Oregon, established guidelines protect the right to free speech, while ensuring that opposing views may also be expressed. The basic guideline says that whenever one person’s or one group’s activities prevent another’s sanctioned activity from taking place, rights are being violated. The university has the responsibility and authority to protect those rights. The university strives to balance the right to dissent with the right to be heard, the right to speak one’s mind with the right to listen. Most building walls and campus fixtures, as well as most bulletin boards, are regulated. Building or department operators may determine what content may be approved (i.e., material related to a particular program, or published by university groups for a university audience). Unapproved or unrelated material may be removed. Material may not contain “true” threats of violence. May not block doors, hallways, stairways, fire exits, fire lanes, or public rights of way including streets, sidewalks, etc. Any marking, including chalking, left on campus buildings or surfaces (including sidewalks and streets) may be removed, consistent with campus maintenance standards and practices. To enable the free sharing of ideas on campus, the UO has rules and procedures for reserving space or other facilities. The person or group reserving the facility is entitled to determine how, within university guidelines, that facility is used. When campus activities conflict with one another, university officials have the authority to request those involved in one activity to stop, move, or change their behavior, so that the other activity can continue. Violations of the standards above may result in university action to stop the behavior, as well as disciplinary consequences for students or employees, and possible legal action. Visitors to the University of Oregon campus have the responsibility to obey federal and state laws, as well as University of Oregon rules and policies, and may be cited for trespass or subject to prosecution for any illegal behavior committed on campus. Faculty and staff members and students may face disciplinary sanctions imposed by the university if they ignore these standards of behavior. Students are subject to the requirements of the Student Conduct Code, and members of the faculty and staff are subjects to UO policies governing Proscribed Conduct, as well as the university’s policies on progressive discipline. Tagged Academic Freedom. Bookmark the permalink. Is this “memory holing” or “gas-lighting”? Maybe just a reasonable relocation. Why the hell do the free speech guidelines have to do with the campus safety office?